The Niger Delta Renaissance Organisation, a pro Jonathan support group has urged the Minister of State for Education, Nyesom Wike not to heat up the polity with his ambition to govern Rivers State, just as it cautioned him against decisive tendencies. In a statement signed by its Spokesman Mr. Kingsley Bejikini, the Organisation, said, Wike's gubernatorial ambition amounts to insult on the collective interest of the people of Ogoni, Rivers South East Senatorial district and indeed Rivers State after his kinsman Rotimi Amaechi. The organization lamented that despite the contributions of the Ogonis to the present democracy, an individual will seek to hold the people to ransom due to his inordinate ambition. As a strong supporter of the Goodluck Jonathan's second term bid, the body said, it views the stance of the minister as a threat to the ambition of the President and the unity of the state. 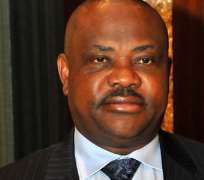 The organization observed that there were sound minds in Ogoni land and the Senatorial district that stand a better chance to deliver the dividends of democracy and would not be confrontational to the President as the Wike group wants people to believe. It noted that if the war of speeches accredited to the Minister is true, then he must be stopped in order not to jeopardize the overwhelming popularity of President Jonathan in the state. The statement added that it was regrettable that the Minister and the state PDP Chairman were bent on frustrating the peace put in place due to their selfish ambition which negates the aspiration of President Jonathan for the people. The organization urged stakeholders in the state to explore avenues to settle the political differences between the governor and the Presidency stressing that both parties working together would sway more Nigerians towards the President for the 2015 polls than the likes of Wike and his co travelers.